Having worked in a Chinese restaurant for almost 4 years, I can’t say that Westernised Asian food is my favourite cuisine. Although anything but authentic, our restaurant does everything it does well so I’d choose anything else over anything in the same category as sweet and sour pork, honey chicken and mongolian lamb any day. 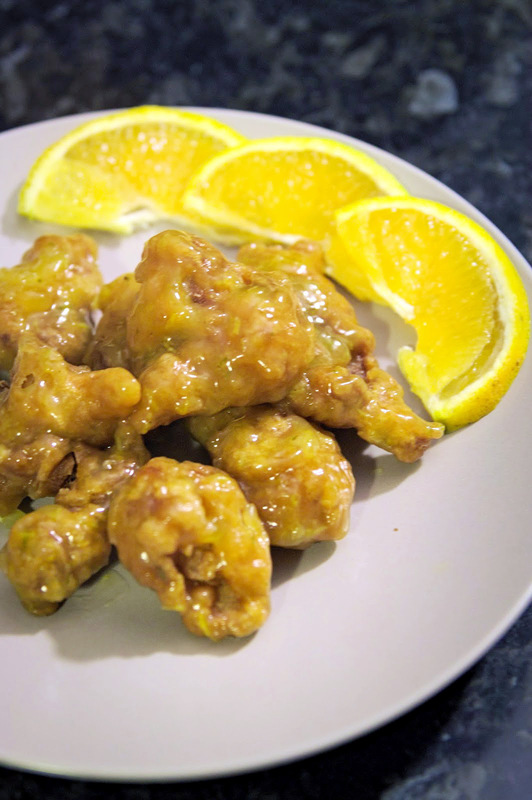 But there is one dish that we don’t do and it’s orange chicken (well actually there’s more than one, but let’s not go into the details…..), so I still enjoy it enough to want to attempt this at home. 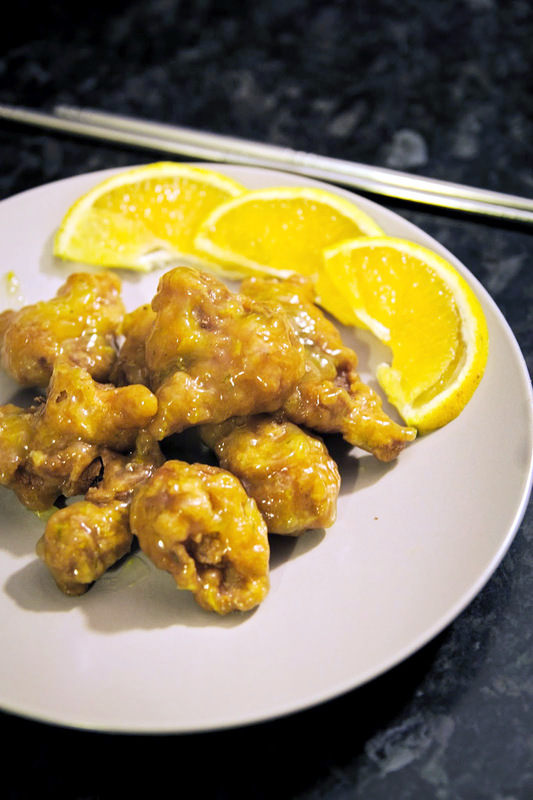 Whereas the lemon sauce for lemon chicken in Chinese restaurants is mostly made of sugar, water and lemon essence, I prefer my homemade orange sauce to be made of fresh orange juice- it’s so sweet it doesn’t make too much of a difference, but there is a freshness that comes through. The recipe is quite simple- basically just orange juice and sugar thickened up to a paste. You have to be careful you get the flavour balance right because you don’t want it too sweet or too sour. Toss through some fried chicken (I cheated and used fried chicken I took from work) and you’ve got yourself a pretty tasty chicken dish! 1. Heat 4 cups vegetable oil in a deep-fryer or large saucepan to 375 degrees F (190 degrees C). 3. In batches, carefully drop the chicken cubes into the hot oil one by one, cooking until they turns golden brown and begin to float, about 3 minutes. Remove the chicken and allow to cool as you fry the next batch. Once all of the chicken has been fried, refry the chicken, starting with the batch that was cooked first. Cook until the chicken turns deep golden brown, about 2 minutes more. Drain on a paper towel-lined plate. 4. Heat 2 tablespoons vegetable oil in a wok or large skillet over high heat. Stir in the orange zest. Add 1/2 cup sugar, chicken broth, vinegar; bring to a boil and cook for 3 minutes. Hi Von, love your orange chicken, look delicious and very addictive. I love the orange fragrant scent, it smell heavenly. Thanks for sharing your recipe. Have never had orange chicken but batter always works for me. lol.